Although these studies have broad implications for RNA diseases in general, they were demonstrated on myotonic dystrophy type 1, an incurable inherited disorder that involves progressive muscle wasting and weakness. 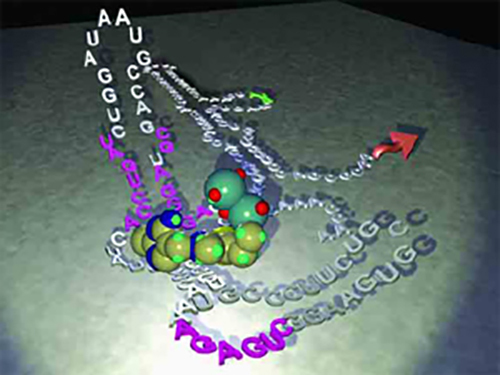 It is caused by an RNA defect known as a “triplet repeat,” a series of three nucleotides repeated more times than normal in an individual’s genetic code, in this case, a cytosine-uracil-guanine (CUG) triplet. In many genetic diseases, there are two copies of the problem gene—a mutant copy that causes a disease and a normal copy that a cell needs to survive. Selective recognition of the diseased gene product has not been possible before. This new study demonstrates that designer small molecules can selectively recognize larger, disease-associated repeats (alleles) over shorter, normal ones. The work also offers an innovative way to track the movement of RNA in a diseased cell via imaging. “We have brought RNAs out of the darkness and into the light by developing a chemical flare that goes off when a drug targets the RNA in a diseased cell and then continues to track the RNA’s movement,” added Dr. Disney.